Mac mini to Be Discontinued? "A scheduled event at Apple's headquarters in Cupertino next Tuesday has some thinking that a significant update to the company's iMac line is imminent. "Members of the press have been invited to an August 7 press conference at 10 am Pacific Time. Apple is remaining typically mum about the details, only saying that the announcements are 'Mac-related' and that Apple executives will be present." "Last week, after reporting brisk sales for the quarter ending in June (including blockbuster sales for the iPhone), Apple said earnings will be disappointing in the current quarter. Why? Higher component costs, back-to-school discounts, and a 'product transition.' Translation: Apple's coming out with some new toys. "The iMac is due for a refresh, and the new version may include a more expensive LED-backlit display, Ars Technica speculates. MacBooks are due for an upgrade, possibly a new, thin model, with a multitouch interface taking the place of the trackpad." "The Mac mini is a misfit in Apple's range, being neither an all-in-one like the iMac or internally expandable like the Mac Pro. While it was positioned primarily as a low-cost Mac for 'switchers' (defecting Windows users) who already owned a suitable keyboard, mouse and monitor, anecdotal reports suggest it was actually more popular as an additional Mac. "And there's the rub. The mini, when equipped with a TV tuner makes a good media centre computer (or home theatre personal computer - HTPC - if you prefer that terminology): it's small, attractive and virtually silent. The problem is that the Apple TV is supposed to occupy that niche - no matter that it makes no provision for a tuner." Link: Mac mini to Be Discontinued? 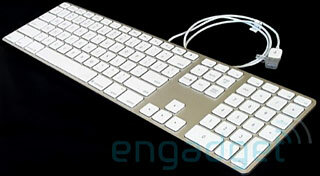 "By now you've seen the leaked photos of the purported new iMac keyboard. The new keyboard design is pretty significant because it represents a shift to a new low-profile design that began with the MacBook. The new keyboard is rumored to arrive as soon as 7 August 2007 with a new iMac revision featuring a super-thin, low-profile aluminum design. "When depressed the new keys are flush with the casing beneath them. The keys are more square (rather than the traditional trapezoidal shape) which means that they're the same width at the top as they are at the bottom. The square shape provides more contact area at the top of the key because it doesn't slope out lower down the key. The new keys tops are completely flat as opposed to the old keytops which are slightly concave. "While I was sure that I wouldn't like the low-throw (often called 'stroke' or 'travel'), chiclet-style keys of the MacBook, my recent switch from a MacBook Pro to a MacBook wasn't as bad as I expected...."
"I had a broken Apple Pro keyboard to deal with at work today, and so, in accordance with one of my favorite mottoes - when in doubt, take something apart - I took it apart. This turned out to be a bit harder than I expected, so I took pictures and thought I would post a how-to guide here. "Altogether, this took me about four and a half hours to figure out and do, although a lot of that was spent searching for screws, screwdrivers, and the H key, which flipped under my desk. It really impressed me with the solid design of these keyboards - I think it would have been much, much harder to do this with many of the 'IBM-compatible' keyboards I've worked with over the years. It was notably easy to take this all to pieces; even the keys popped off easily, with a noise very reminiscent of Legos™." "With LCD monitor vendors such as Dell and Apple are now adding 20-inch widescreen monitors into their product lineup, demand for 20-inch widescreen panels is picking up in the industry, according to market sources. "Currently, sales of 22-inch LCD monitors are better than those for 20-inch widescreen models in the market as the number of 22-inch LCD monitor suppliers is larger than that of 20-inch, noted the sources, adding that most PC vendors are bundling 19-inch and 22-inch widescreen monitors. "22-inch monitors are expected to be the next mainstream model in the widescreen market which is currently dominated by the 19-inch segment, the sources added." "The switch from Windows XP to Vista has created a world of opportunity - not only for Microsoft, but for supporters of competing operating systems. While Microsoft is hoping it can move its customers easily to a new version of Windows, Apple and the Linux community see the transition as a chance to demonstrate the advancement and advantages of their OSes - and maybe steal some customers. "If you're one of those Windows users who are less than enchanted by what you've seen of Vista and you're thinking about switching, you face some tough choices that can make you feel like a pioneer. Is it a good idea to move to a Mac, with its easy interface, high level of safety and stability - and higher prices? Or is it better to adopt a Linux distro, which is free (or, at least, inexpensive), supported by a range of imaginative developers - and not quite newbie-friendly? Either decision forces you into new, unfamiliar territory. "For answers, we went to two writers who have a great deal of experience with Windows PCs but have recently experimented with moving to either a Mac or Linux. Mitch Wagner is an executive editor here at InformationWeek who has become an enthusiastic Mac convert, while Serdar Yegulalp, who has written extensively about Microsoft Windows, is now exploring the world of Linux and Linux distros. In other words, while both like to tout the advantages of their newly chosen operating systems, they are also well aware of the drawbacks. "In the following pages, they lead a guided tour of the two OSes, paying particular attention to eight important areas: Installation & Migration; Hardware Support & Power Management; Networking, Web & Wireless; Productivity; Entertainment; Security; Working With Windows (because we couldn't completely ignore Microsoft); and Stability, Backup & Disaster Recovery." Link: Linux vs. Mac: Which Is the Better Alternative to Microsoft Windows? "The other day I posted a poll which asked 'If you were to ditch Windows, would you go to Linux or Mac?' The results of that poll are, I think, very interesting. "Out of just under 3,000 respondents, 46% indicated a preference for Linux in the event of them abandoning Windows while 43% indicated a preference for Mac. But what's really interesting is the 11% who state that they'd switch to an environment where there was a mixture of the two operating systems. What's interesting about this is that it means that there's a growing interesting in the adoption of a more agnostic approach to operating systems." Link: Mac, Linux or Both? PR: To offer computer users more comfort, Logitech has unveiled a groundbreaking keyboard design that is a significant evolution of the familiar straight keyboard, yet doesn't require people to relearn how to type. The new Logitech Cordless Desktop Wave and the Logitech Wave Keyboard feature the innovative Logitech Comfort Wave Design, which increases keyboard comfort for Mac and PC users who want to do more, more comfortably. Logitech combined three elements in its new design to enhance comfort without requiring people to change the way they type: an innovative wave key-frame design, a U-shaped constant curve and a cushioned, contoured palm rest. 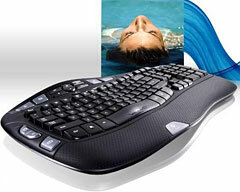 In comparison to ergonomic keyboards, people can use a Wave keyboard immediately - there is no learning curve. The Comfort Wave Design guides hands and cradles fingers to create a naturally comfortable typing experience. "With the increased awareness and demand for comfort in our day-to-day lives, Logitech's new products offer a timely solution," said Denis Pavillard, vice president of product marketing for Logitech's keyboards and desktops. 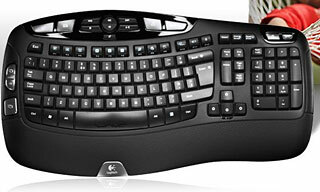 "According to a study at Harvard, for Logitech, the average person types approximately 2 million keystrokes every year. That's equal to 200 hours of typing. The Logitech Wave Comfort Design will delight people by offering the perfect balance of comfort and usability." Fingers vary in length - for example, pointer fingers are longer than pinky fingers. To address this fundamental principle of hand shape, the signature element of the new Comfort Wave Design, its gradual wave-shaped contour, cradles the fingers with a shape that supports their actual, varied length. The Wave keyboard keys are highest at the A and Enter keys, which are typically hit by the little fingers. Moving inward toward the pointer fingers, the keys decrease in height until reaching the D and K keys, which are typically hit by the longer middle fingers. The keys move up again in height to accommodate the pointer fingers at the G and H keys. The maximum distance between the keys' peaks and troughs, the lowest and highest keys, is 4 mm. Because hands and fingers can rest in a more natural position and keys are closer to fingertips, the Wave key frame helps eliminate awkward hand and forearm positions, enhancing comfort and improving productivity. The U-shaped constant curve, compared to other curved keyboards, features consistently sized keys that let people type with confidence and comfort. The subtle 5-degree curve allows people's hands to open up and take a natural position instead of forcing the wrists to bend. And because each key is the same size and the same distance from one another, the learning curve is minimal; people can start using the keyboard right away. The space bar, the most frequently hit key, also incorporates the wave and curve design - and its increased size makes it easy to hit. To further enhance ease of use, the Comfort Wave Design offers large, convenient hot keys that are easy to see and hit. On both the PC and Mac, with Logitech software installed, hot keys can be mapped to launch folders, Web pages, or applications, such as photo galleries and music applications. For Windows Vista users, shortcut keys activate Flip 3D as well as Windows Sidebar and gadgets. Logitech developed new Vista gadgets: a status indicator for caps lock, num lock and scroll lock; a typing-speed indicator; and an error-rate tracker that calculates the number of times the user hits the backspace key. For Mac users, the default assignment for the Media Center hot key is Front Row. Wave key design: Contoured wave-shaped key design conforms naturally to your fingers. Constant Curve design: A curved profile and uniform-size keys promote an ergonomically correct, more comfortable hand position. Start enjoying the benefits instantly, without having to relearn typing on a different keyboard layout. Cushioned, contoured palm rest: The soft surface encourages a relaxed position for long typing sessions. Adjustable keyboard height: Use the three-way tilt legs to set the height to suit your personal style. Audio cable management: Keep headphone cords out of the way by routing them through the channel on the underside of the keyboard. Easy access to Windows Vista: Large, one-touch controls give you direct access to key Windows Vista features, including Flip 3D, Zoom, Photo Gallery, and Gadgets. Instant media access: Use the convenient one-touch controls for volume and media playback. A dedicated button starts Media Center and Front Row. Programmable F-keys: Get instant access to favorite applications, games, folders, and Web pages with customizable F-keys. The Logitech Cordless Desktop Wave keyboard-and-mouse combination is expected to be available worldwide beginning in late August and will have a suggested retail price of $89.99. The corded Logitech Wave Keyboard is expected to be available worldwide beginning in October and will have a suggested retail price of $49.99. PR: Didn't you love how you could twist and turn the screen around its gooseneck? Up, down, left, right... How easy it was to show your best work to your friends just by moving the screen. The iMac G5 is different. An insanely great machine with just one flaw: It doesn't swing! All it gives you is a little nod. The all-new iNeck twists and turns your new iMac G5 just like the old days. Thanks to the extremely elegant and quality built design it unobtrusively complements your new iMac G5. In fact, you'll hardly notice it's there. Today's speed at yesterday's convenience! Your iMac G5 stands like a rock and swings like a top! PR: Granite Digital, a leading manufacturer of FireWire, SATA, SCSI, and USB storage solutions, cables, and diagnostic tools, today announced it has begun shipping a line of Drive Shields™, silicon rubber sleeves that slip over any 2.5" or 3.5" SATA or IDE Drive Mechanism and protect the drives from static, shorts, dirt, vibration, and shock. 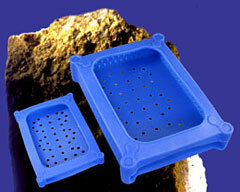 The kit includes: one 2.5" Drive Shield and one 3.5" Drive Shield and retails for $9.95. "Drive Shields is a simple solution for protecting SATA or IDE Drive Mechanism from damage when not installed in a computer or in a enclosure," stated Frank Gabrielli, President of Granite Digital. "As a drive enclosure manufacturer for over 20 years we have had countless drive mechanisms damaged while sitting on our lab benches or while being transported. A simple inexpensive protector would stop this needless waste and allow our technicians to test, share, move, or use any mechanism without worry of hurting the electronics or mechanism." Supports all SATA or IDE 2.5" or 3.5" drive mechanisms. Intended for Intel Mac OS X machines, CrossOver Mac will allow Mac users to run their favorite Windows applications and games seamlessly on their Mac. Windows files can be opened directly within your file browser, or from email attachments. No rebooting, no switching to a virtual machine, and no Windows Operating System license required; CrossOver is a complete replacement for your Windows OS as far as your Windows software is concerned. Adding new Windows software is easy. Just place your install CD in your Intel Mac, and CrossOver will recognize it and offer to begin the installation process. 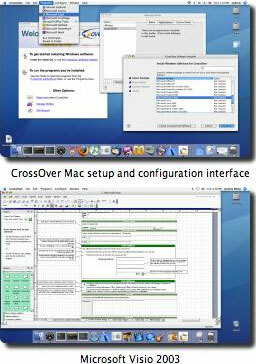 CrossOver then completes the installation and configures your application to run on your Mac. The catch is that CrossOver doesn't run every Windows program, and some programs that do run, run with flaws. However, CrossOver reportedly does work very well for many people. Added handling of mailto: links, both within and outside of CrossOver. Added support for installing a set of Windows-specific TrueType fonts. Fixed a problem with Quartz-wm on new Tiger install disks. Previously this problem caused CrossOver to crash on some new Macs. Added a feature that will check for available updates. Some cosmetic changes to the GUI. No major redesigns. Added support for RPC over HTTP in Outlook 2003 when running in a Windows XP bottle. This allows use of HTTP mail in Outlook. Improved authentication support in Outlook 2003. Improved the Equation Editor installation process. Several IE fixes: Wikipedia.org and Microsoft.com now load properly. Improved IE launch times. Fixed a problem with black icons in the Outlook shortcut bar. Major update of DirectX support. "If you decide to purchase CrossOver Mac (even without reading the long description provided in the link above), and feel that you did not receive a fair value, we will refund your money, no questions asked." PR: Why throw away your money on a multitude of utilities that force you to learn different interfaces and deal with a variety of companies and/or different products? Micromat gives you everything you need in one box - for far less money. TechTool Pro 4 is a feature-packed release of the most comprehensive diagnostic, repair, and maintenance utility of all time. A must-have Macintosh application, this utility from Micromat is truly the one indispensable product you need to ensure your Mac is always trouble free. TechTool Pro 4 is a complete Macintosh repair shop in a box. In fact, it's so good that Apple includes a copy of its sibling, TechTool Deluxe, in its AppleCare Protection Plan. If you have ever experienced a system bomb, freeze, crash, or indecipherable error code, TechTool Pro 4 can help you get your computer running smoothly again. You don't need to be an expert technician to run TechTool Pro 4. The interface allows you to easily perform a comprehensive suite of tests unattended, so even novices can run the program with just one click of the mouse. At the conclusion of testing a detailed report is generated. This report summarizes what was done, alerts you of any problems that were found, and instructs you how to proceed in that case. If you are the type of user who wants to explore the inner workings of your hardware and software in depth, TechTool Pro 4's detailed tests and reports will delight you. Almost every type of test you can imagine is available. TechTool Pro 4 even includes data recovery routines. These can often rescue important files from drives that no longer mount. If you wish, TechTool Pro 4 will also monitor your computer in the background, alerting you of developing problems so that you can address them as quickly as possible. The program multitasks for optimum speed and performance. An innovative feature unique to TechTool Pro 4 is the eDrive. The program lets you create an emergency startup partition that includes TechTool Pro 4 on one of your hard drives. It does this without the need to reinitialize your hard drive. Once you have an eDrive (which can be easily updated), you no longer need to use the program CD for testing or maintenance. No product comes close to TechTool Pro 4 for ensuring that all of your hardware and software is operating at peak performance. No other software gives you the peace of mind that comes from knowing that your valuable data is protected by the latest technology. With a single mouse click, TechTool Pro 4 can automatically run a series of sophisticated tests that will troubleshoot almost any problem you are having with your Macintosh. Nothing else even comes close to TechTool Pro. 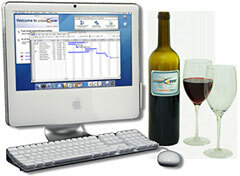 TechTool Pro includes options to thoroughly check various hardware components, drives and other aspects of your computer system. One of the most important tests is the S.M.A.R.T. test, which checks for impending drive failure. This feature defragments the files on your hard drive and consolidates all of the free space into one large block. Optimizing enhances the overall performance of your drives and simplifies file storage layout. TechTool Pro includes routines that can search a damaged drive and attempt to recover valid files to another location. Even if a drive is damaged beyond repair, you may still be able to save important data that had not been backed up. The Safety feature can be configured to protect your drives by automatically creating backups of critical drive directory data. It can also test the computer for developing problems and alert you, both onscreen and via email, if problems are detected. One of the most innovative features of TechTool Pro is the eDrive. This is a bootable Mac OS X partition containing TechTool Pro and a small copy of your system that you can use in an emergency or for regular maintenance. It is created on one of your hard drives without the need to reformat. Beige G3 machines not supported. For these and older Macintosh models, use TechTool Pro Classic. Macintosh PowerPC G3 or greater. Mac OS X 10.4 or greater. 512 MB RAM or greater.